If it’s already 2013, it’s fair to say that 2012 was a tumultuous year in multiple respects marked by economic uncertainty, ineptitude of world leaders to agree on major global issues, eruption of civil unrest and in some instances civil war, important presidential elections, and natural disasters that surely left their mark for years to come. Europe, once a key engine of world economy and still a major destination for export oriented economies, plunged into a full-fledged financial crisis that has yet to emerge from, with uncertainty and crippling high unemployment rates becoming the hallmarks of the collective Euro-zone. Greece and Spain are in depression, as much as we like to avoid to use the world “D”, while Italy and France are moving toward greater stagnation and German manufacturing slowing, not to mention mountains of European debt that no one seems to have a clue how to pay. The Eurozone is essentially in a struggle to redefine itself on a wholesale basis. In the U.S., a historic presidential election gave a sitting president a second term with the economy looming large for Americans as the most pressing issue. Also, the issue of inequality in the U.S. became gradually part of national discourse as U.S. lawmakers continued their tug-of-war over fiscal issues and tax code. In the meantime, a hurricane by the name of Sandy ravaged parts of Northeast U.S., leaving in its path miles of devastation and thousands of Americans homeless. And in the waning days of 2012 the country witnessed a horrendous act of savagery in Newton Connecticut, where a young man forced his way into a school, killing 20 children and six adults. Many Americans will undoubtedly remain in a state of shock and mourning throughout the holiday season, while sour-searching their gun laws and gun lobbies. In the Middle East, the region continued its push into the new era of post-Arab Spring, an era that will continue to change the region’s social and geopolitical dynamics and determine the outcome of the battle between forces of modernism and tradition. This all the while some of the region’s entrenched dictatorships made the decision to hold on to status quo and present cosmetic reforms as genuine efforts towards greater transparency in governance. The Assad regime, with ideological and logistical support from its regional and international allies, defied the odds and murdered its way into the country’s major metropolitan cities with the mere goal of clinging to power. Not to be outdone by Assad, some of the rebel groups also demonstrated an impressive degree of brutality in their treatment of Assad forces in their captivity. A not so bold prediction for Syria is that Bashar Al-Assad will rule Syria only for a few months of 2013 and that the region’s geopolitical dynamics will enter a new phase. Throughout 2012, the Middle East also was witness to continued U.S.-Iranian geostrategic rivalry, which made its mark on such issues as the shape of the new Middle East (exemplified by Egypt’s evolving political dynamics), Iran’s nuclear saga, and the future of the Persian Gulf security, while the Iranian economy was hit hard with meaningful and biting sanctions, seriously impacting the lives of ordinary Iranians and at the same time exposing the Iranian leadership to serious prospects of economic calamity that could entail social unrest. Despite all the uncertainties outlined above, 2012 was a year with great reads by some astute observers and authors in the field of international affairs who offered followers of international politics books that certainly deserve attention, appreciation, and recognition. We selected six books by such authors in three categories that cover nearly all aspects of international politics. The three categories are: Global affairs, U.S.—Iran relations, and the Middle East/Arab Spring. These books were selected based on reviews that they received, the subject of the book in terms of its significance for regional and global politics and economies, and each author’s expertise and professionalism in his/her respective field, irrespective of his/her ideological affiliation. The following are the best books of the year in international affairs. G-Zero world, therefore, will be based on more individual strategies than common policy approaches. In this new international climate, according to Mr. Bremmer, the U.S. will be less inclined to take an assertive leadership role due to costs, risks and burdens that come with such a foreign policy, not to mention heated debates at home on fiscal policy. Mr. Bremmer also draws attention to emerging global powers like Brazil, India, and China and their reluctance to assume leadership on issues that know no border such as cyber-security and climate change. Mr. Bremmer goes on to suggest that in a G-Zero world “Washington is in no position to bail out Europe, stabilize the Middle East, or lead the way toward a global deal on carbon emissions. And neither is anyone else for the foreseeable future”. “Every Nation For Itself” is essential reading for those in search of understanding the indecisiveness of our leaders and how lack of U.S. leadership will impact issues of global significance. This is a book that offers a unique and sharp analysis of geopolitical issues by–as strange as it may sound–looking at country maps. 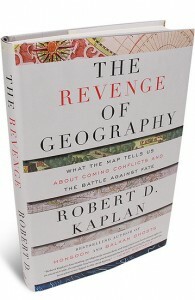 Robert D. Kaplan, Chief Geopolitical Analyst for the private global intelligence firm Stratfor and a non-resident senior fellow at the Center for a New American Security, argues that in understanding the rise and decline of powers the study of geography is as important as studying socio-economic and political forces. Geography, according to Mr. Kaplan, teaches us several stories. For example in a chapter on Iran, Mr. Kaplan looks beyond borders and explains however arbitrary borders maybe, the fact that the Persian people have been living on the Iranian plateau has been a permanent feature of history since antiquity and it gives a country like Iran a legitimacy and stability that many other countries in the Middle East and Sub-Saharan Africa lack. In Europe, Kaplan draws a picture of Poland as an emerging pivot state in 21st century due to its massive and untapped shale gas reserves, which will enable Poland to become a power to be reckoned with, considering that geopolitically Poland has been oscillating between Germany and Russia. “The Revenge of Geography” in a sense offers students of history the ability to understand global dynamics in physical terms such as mountains, rivers and their flow, land, and seashores. This book certainly makes for an entertaining yet serious read by an author whom in 2011 the Foreign Policy Magazine named as one of the world’s top 100 global thinkers. Arguably the most comprehensive account of U.S.—Iranian rivalry over the past three decades, this book uncovers aspects of the tense relations between the two countries that include confluence of interests, ideological differences, and clash over geopolitical objectives. 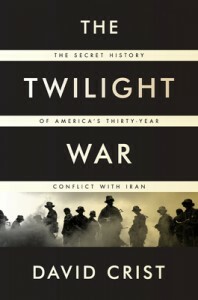 The author, David Crist, a senior historian for the U.S. federal government and a recognized expert on Iran, chiefly argues that over the past 34 years Tehran and Washington have been practically at a shadow war with each other with regional countries as their battleground. Mr. Crist offers declassified accounts of key events in U.S.—Iran rivalry such as shipment of arms by Israel to Iran during the Iran-contra affair, the 1983 bombing of U.S. marine barracks in Lebanon including for the first time the name of the bombers and their secretly recorded conversations with the Iranian ambassador in Syria. Mr. Crist describes how Tehran and Washington defied each other in the 80’s and 90’s, seeking to destabilize each other’s interests in the region and beyond. Some of these acts include American recruitment of Iranian agents to support American forces in Iran, a detailed account of the 1996 Iranian bombing of Khobar towers, and the Clinton administration’s plans for a military action against Iran. This is a book that vividly outlines the significance of U.S.—Iranian conflict in such detailed, meticulous, and at times riveting accounts for any observer and student of international affairs and for those who wonder why an open armed conflict between these two countries will be devastating for the entire Middle East as well as for world economy. This is a detailed, unique, and different account of U.S.—Iranian relations and tensions under the Obama administration that focuses on missed opportunities by both sides and offers diplomatic options that, according to the author, are yet to be explored. The author, Trita Parsi, is a longtime analyst and observer of Iranian affairs and President of National Iranian-American Council (NIAC), an organization based in Washington D.C. that advocates greater diplomatic engagement between the two countries and opposes harsh economic sanctions against Iran. Mr. Parsi argues mainly that not all diplomatic avenues have been exhausted in the tense U.S.—Iran relations despite existing sharp divisions that he puts on display in the annals of power both in Tehran and Washington. 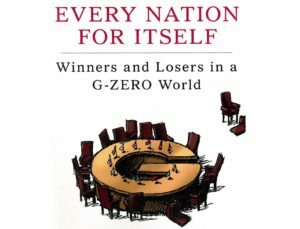 The book derives its name from remarks made to Mr. Parsi by a senior State Department official who said “our Iran diplomacy was a gamble on a single roll of the dice.” Another significance of this book is its demonstration of diplomatic efforts by other states such as Turkey, Brazil, China, Japan, and Russia to break the deadlock between the two nations, a deadlock that Mr. Parsi calls “institutional enmity”. 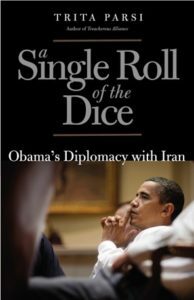 “A Single Roll of the Dice” is essential reading for understanding important aspects of U.S.—Iranian diplomacy that are often under-reported in mainstream media. Saudi Arabia is perhaps the only remaining country in the world that takes its name from a ruling family — the Al Saud. It has vast hydrocarbon resources that feed the world’s insatiable hunger for energy. It also is an absolute monarchy founded upon religious principles of Wahhabi Islam. 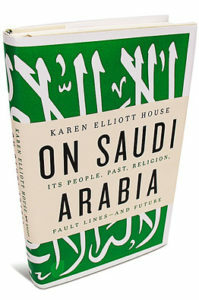 This book by Karen Elliott House offers a chilling and detailed response to the question on the minds of many as to what kind of a country Saudi Arabia really is. “On Saudi Arabia” reveals how a decades-old alliance between the royal family and the Wahhabi religious establishment sets the agenda for nearly all aspect of social, political and cultural life in this shrouded oil rich nation. Ms. House uncovers the depth of corruption by the royal family, the glacial pace of socio-cultural and political reforms and their inefficacy to make a dent in the lives of average Saudis, and puts on display the Saudi leadership’s sense of insecurity in dealing with regional revolts known as the Arab Spring by spending billions of its petrodollars to preclude its citizenry from any thought of taking to the streets. This book is essential reading for those interested in exploring untold aspects of Saudi society, its power structure, women’s rights, and in understanding the dynamics of a kingdom increasingly challenged by new regional dynamics and revolution in communication technology. The Arab Spring was sparked by the self-immolation of a Tunisian vegetable vendor that later swept across the Arab world and opened the region to a new era of uncertainty. In “The Battle for the Arab Spring” Lin Noueihed and Alex Warren describe the socio-economic roots of the Arab Spring and assess what lies ahead for these new emerging governments that are rising from the ashes of old dictatorships. Lin Noueihed is a Reuters editor based in London. She has reported from the Middle East for over twelve years, covering politics, economics, and conflict. Alex Warren is a director of Frontier, a Middle East and North Africa consultancy. According to Mr. Warren and Ms. Noueihed, the Arab spring is the result of a new mindset that fearlessly resists humiliation and corrupt practices of one-man rule and demands transparency in governance and the ability to provide for basic economic needs of the masses. The authors offer an optimistic view of future developments in the region, arguing that Islamists with success at the ballot box will face a test to provide dignity, prosperity and political freedom, values that so many in the Arab world have risked their lives for. 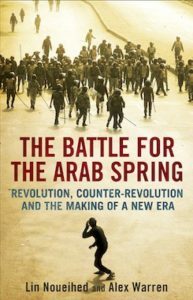 The Battle for the Arab Spring is an important book that enables readers to explore underlying cultural and social forces behind the revolts that continue to shake the Middle East.